This week has been insanity. I have an install later on today and the week or two before hand is always madness. - Handful of seamstresses flaking out on me when I need curtains/pillows/cushions made. - Fabric on backorder that has yet to arrive and I need 4 pillows made with it! - Massive graphic designer problems as we tried (actually still trying) to do a little DIY project we dreamed of doing in one of the rooms. Still need to run out and grab a couple more items, head to the new seamstress (yay!) and pick up everything and head to clients home and get it all put together. While I would love to say I'm going to relax over the weekend it's not happening. I need to finish my bed, finish a paint project and hang a bunch of things in my house! I so wish I were doing what you are doing this weekend, but I am not. My family (husband & two kiddos) and I will be traveling 3 hours away to attend a wedding outside on Saturday. Oh, did I mention I live in Texas? It should be outlawed to have a wedding outside in August in TEXAS! I feel just like you! I'm having a party tomorrow and have 1 million things to do, work my normal job, and at some point take a shower??!!! All those bags make me happy inside. I feel like my house always looks like as of late haha! It makes me feel crazy! I will have a little fun on Saturday... but when we're not out celebrating other people's milestones, we'll be knocking some projects off our always growing to-do list, and cleaning! i wish, i work retail and its tax-free weekend here. :( no fun. Maybe I'll be having more fun than you, but I doubt it. My family is insisting I go camping. Don't fret my friend, the fruits of you labor will be worth all the effort that goes into making an interior a home. Good luck! Sounds like you had a busy week, Camila! Hope you get time to recoup this weekend. No big plans for me -- hoping to get a few small things done around the house but R&R is definitely on the top of my list! Perhaps it is just me, but I think your weekend sounds really good. I'd love to be a fly on the wall, or an additional set of hands to help! You're doing great work up there next to the big city! 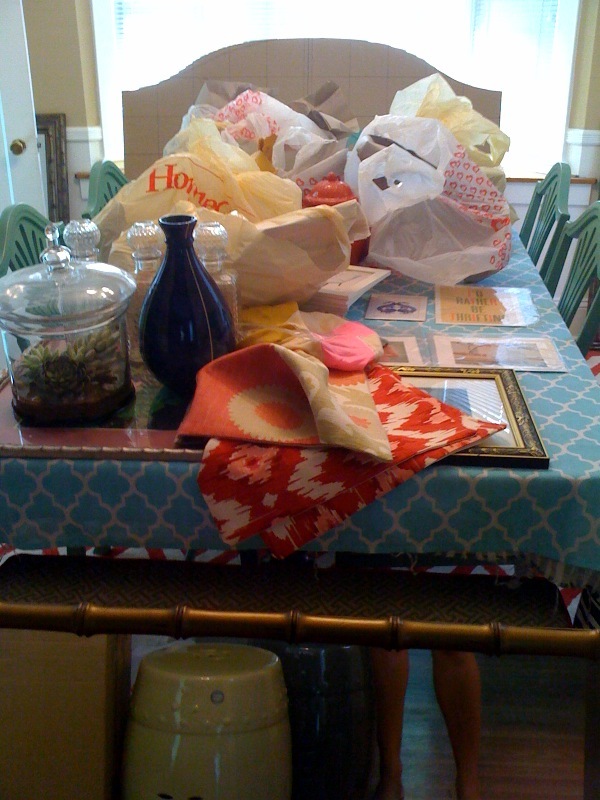 I love those fabric swatches on your dining table! Sorry your so swamped - but really I'm sure thats a good thing (maybe not for your mind but for your career)! Thanks for all the support! I'm totally living the dream. Just totally wiped! Charging my camera as I type so I will try to snap as many pictures as I can. Glad to see that other designers have inventory all over their house before an install!!! I cannot wait to see Eat Pray Love with my favorite girlfriends this weekend!! 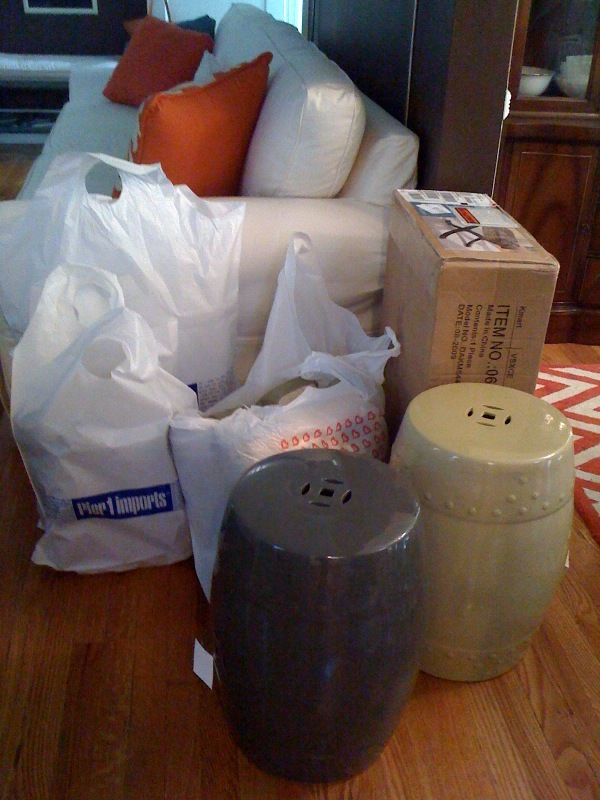 But I did spot a Pier 1 bag in your picture... that should be fun to unpack!! Hang in there! I am in the same boat. Sounds like you need a little break. Try to have a great weekend! But you will have a cool room when it's over. 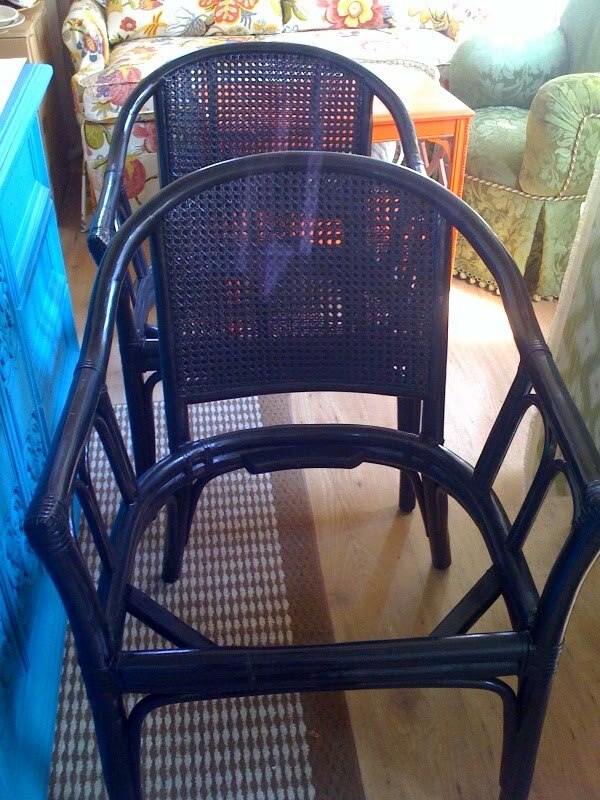 Love the collection of furniture you've got going! Can you share where you got those drum-like end tables/stools that are in the first two pictures? Thanks and good luck with everything! Boy sounds exhausting! I've had weeks like this too! Good luck! Well, your house is sure filled with awesome stuff that will eventually make its way into other people's houses! Looking forward to seeing what you do with it all! Where are the cute garden stools from? Peek a boo in the kitchen! Pops of Color at the NYIGF!